Building stories and metaphor in business has proven power. Research has even shown that stories naturally sneak into the unconscious mind, bypassing the conscious filters that stop direct suggestion being accepted unchecked. Freytag’s Pyramid — a dramatic structure that can be traced back to Aristotle. Sometimes referred to as ‘the five act formula’. As long as communication has existed, we have communicated via stories – from pictures on cave walls to flat screen TV’s. People are attracted to stories because we are social creatures and we relate to other people through perceived shared experiences. Storytelling evokes a strong neurological response. Neuro-economist Paul Zak’s research indicates that our brains produce the stress hormone cortisol during the tense moments in a story, which allows us to focus, while the cute factor of the animals releases oxytocin, the feel-good chemical that promotes connection and empathy. Other neurological research tells us that a happy ending to a story triggers the limbic system, our brain’s reward centre, to release dopamine, which makes us feel more hopeful and optimistic. Think of a film, or even advert, you enjoyed and consider the key story structure that hooked you; was it overcoming adversity or something similar? 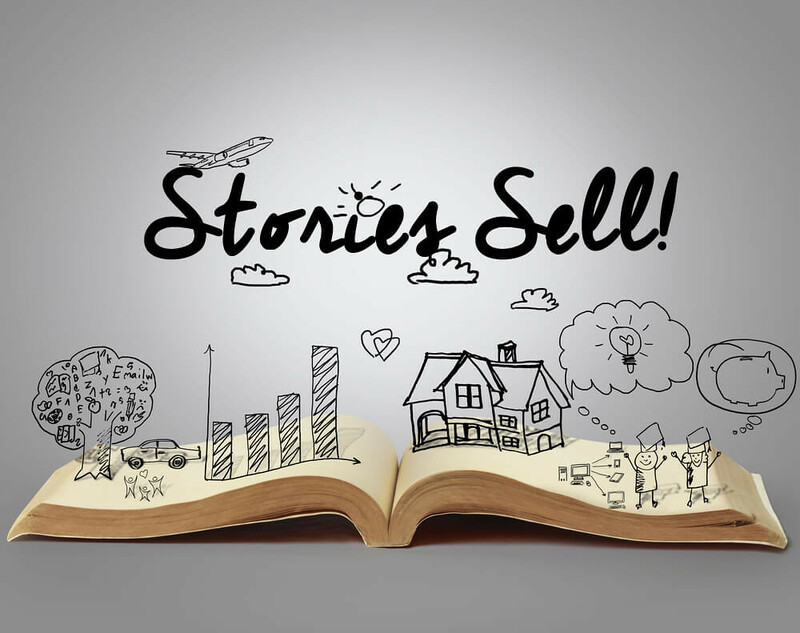 Building stories in Business enables both staff and clients alike to emotionally connect to the message and buy into the values embedded in the message. From Shakespeare to Shelley and from advertisers to politicians, people across the world have leveraged the effects of metaphor to convey new ideas and concepts and to appeal to our emotions. However, metaphors are not just, for when we are being creative. We use metaphors every day for communicating complex ideas. In fact, researchers estimate that we use, on average, six metaphors per minute in ordinary speech (Pollio, 1994). This is because metaphors underpin our thinking and rise to the surface in the words we use. Some are very obvious: I’m banging my head against a brick wall; there’s a big knot in my stomach; he’s burying his head in the sand. Others are embedded in our sentences and do not stand out as much: I’m building a new business; I am bottling up my feelings; I need to follow through on my tasks. Metaphors have the power of enabling each individual to connect the metaphoric interpretation to each specific context in a way that best fits their map. But metaphors are a double-edged sword: when poorly wielded they have the potential to cause more harm, yet when wielded by a skilled hand, they cut to the heart of the matter. Framing correctly ensures the content and contexts can be connected appropriately.